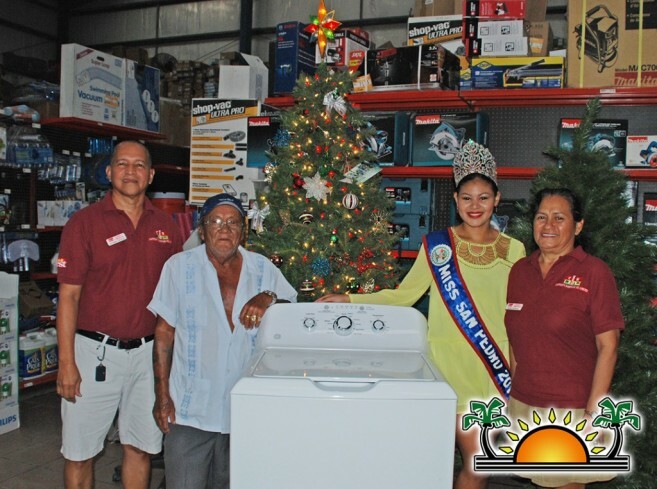 The annual raffle extravaganza at Castillo’s Hardware Company Limited took place on Friday, December 23, 2016. For every purchase or account payment of $50, customers had a chance to win one of five fabulous prizes. Customers gathered to witness Miss San Pedro Maresha Thompson draw the tickets, hoping they would be one of the lucky winners. Owner of Castillo’s, Mr. Alfonso Castillo, shared a few words of thanks to customers and friends via Reef Radio airwaves. With the official business out of the way, the barrel was turned and Maresha proceeded to pull the first winner, that of the fifth prize. Angelica Ramos was the lucky winner of a Makita Cordless Combo Kit. Walking away with fourth prize, 10 gallons of Do IT Best Paint and Primer in one was lucky Mr. Efrain Guerrero. Third prize was a Perfect Aire, 12,000 BTU Air Conditioner, and one lucky Ms. Anita will have a cool summer this year! Second prize was a GE heavy duty washing machine, and taking the prize was Eleena Ayuso/Felix Ayuso. The fifth and final ticket, for the grand prize of a 26 CF Stainless Steel Frigidaire Refrigerator was won by none other than Emil Lisbey! Congratulations to all the winners, and here’s to a prosperous 2017 at Castillo’s Hardware Company Limited.